Please try to arrive a bit early (~9:45) so that the first round can start promptly at 10:00 am. This is simply an awesome location for a war! As you can see in the above image, there are lots of trees to use for cover, but spread out enough to allow for lots of room to maneuver. There are also two different playground areas that might also be usable for CTF or other objective games - I don't have any shots of them yet though. EDIT: Since the attendance for this war looks to be a bit smaller than last time, I am going to try something. Darts that weigh roughly the same as a #6 slug and still maintain a felt tip will be accepted for use provided you allow me to inspect them for safety and let me test fire them on you and have you return the favor. Keep the weight in mind though - I don't want slingshot weighted darts popping up please. Please do not count on these darts as your sole source though - if they are deemed unsafe for any reason, you will not be allowed to use them. Think of this more as a way to war-test darts that you have already tested a bit at home for safety and practicality. - Eye protection - anyone under 18 MUST wear it. 18+ at your discretion, though it is still strongly recommended and at your own risk. - Lunch / Money - There are lots of fast food places within a 10 minute drive. You are of course welcome to bring a bag lunch and eat on the field during the lunch break. - Proper clothing - Dress for the weather. Also, don't be a moron and show up in camo unless it is neon pink or something. - Any and all missle/rocket/ball shooting weapons you might have access to. You might find they come in handy during some of the game-types, and they are always useful for breaking shields. - Blasters or other gear that could be mistaken for actual weapons (i.e. black-painted blasters, silver "knives", etc.). These should definitely be left at home. - Participants under 13 years old are welcome, but MUST be accompanied by a parent or a responsible adult (18+) who will assume full responsibility for the youngling's actions, attitude and safety. I will only assume responsibility for younglings that I personally bring. NO EXCEPTIONS. - We don't do "barrel tapping". Don't shoot someone from five feet away with your high-powered primary though. If you have a melee weapon, use that. If you have a weaker side-arm, use that. - If you act like a 3-year-old, we'll send you home like a 3-year-old. - Please clean up after yourselves - a trash bag will be provided, and everyone is expected to participate in dart-sweeps. - Please note that there are no restrooms at the war site. Go before you get there, and go during lunch. You have been warned! - Please keep the loud outbursts and swearing to a minimum - we will be playing in a schoolyard with nearby residential areas and don't need any residents or passers-by to have reason to complain about us. - We will break for lunch some time around 12:00 or a bit later, probably for 30-45 minutes. Melee weapons will be allowed, though they should conform to a few basic rules. - No metal should be used in the construction of the Melee weapon. - All striking surfaces should be covered with a sufficiently thick layer of foam. - Anything I deem ridiculous or dangerous will not be allowed. - Melee weapons can be used for blocking darts just like shields (see below) - but only if they are in your hand. If your Melee weapon is holstered, a hit on it counts just like a gun hit. Blasters shooting over 50' will not be allowed to use a shield. Shields may be used to deflect darts - hits on shields do not count as long as the shield is in your hand, strapped to a blaster that is in your hand, or strapped to your forearm. A shield strapped/slung anywhere else will not block hits - it will count the same as a gun hit. Balls, missiles, rockets, etc. (basically any ammo larger than a Mega dart) may not be blocked by shields or Melee weapons - a hit on a shield or Melee weapon with ammo of this type will count as a normal hit. Shields can be made from whatever, cardboard should be reinforced with duct tape. Shields that do not meet the specifications for Melee weapons may not be used as such. (i.e. Don't go whacking people with a large wooden shield!) Shields that are deemd unsafe for any reason will be disallowed. Edited by Ambience 327, 10 September 2012 - 09:11 PM. 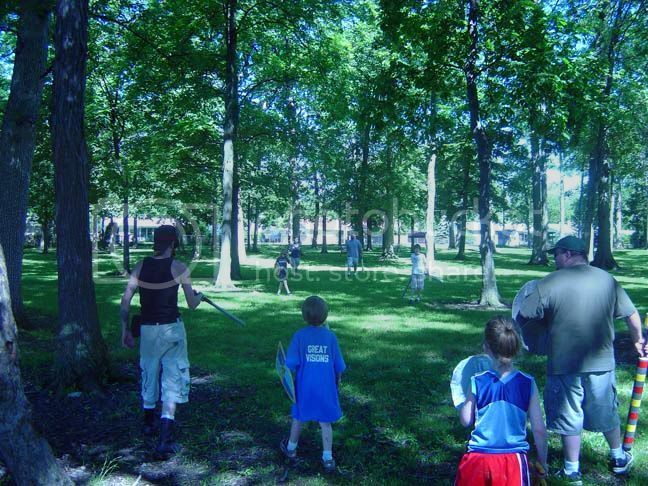 The fourth exciting Nerf War in Fort Wayne, IN. Setup: How the field is set up, where teams start, and any special areas or equipment that will be used for the game type. Respawn: How many "lives" each player has, and how they go about returning to active play. Objectives: The goals which the teams work towards. This may be the same or different for each team. Special Rules: Any unusual rules specific to this game type. Variants: Any specialised variant rules for a game type which change the objectives, setup, etc. These may or may not be used, in part or in whole. Setup: Teams begin play at their designated "spawn point" (1 per team), which should be spread out evenly around the play area. Nothing else is needed. Respawn: Unlimited, 15-count at designated "spawn point"
Setup: Each team is given a "base" where their flag is kept, as well as one or more designated "spawn points" (which should be at least 20-30 yards away from their "base" locations). Players begin play in their "base". Objectives: Take your opponent's flag from their base and return it to your base without being tagged. The first team to return the enemy's flag to their base wins. Variants: It may be declared that both flags must be at your base in order to win. In this case, players are always required to move any flag they are carrying towards their base as quickly as practical. It may also be declared that a player carrying the flag may not use their blaster while carrying it. (Melee weapons may be used as normal.) It is also possible that the flag may be a melee weapon, and the only melee weapon allowed in the game. Setup: Each team is given a "base" location consisting of a bucket filled with a number of balls (3 or more), as well as a designated "spawn point" (which should be at least 20-30 yards behind their "base" locations). Players start at their designated "spawn point". Objectives: Take balls from your opponent's buckets and return them to your own bucket. The team with the most balls in their bucket when the time is up wins. Balls not in buckets when time is called do not count towards any team. Special Rules: A player may only carry a single ball at any given time. If a player is hit while carrying a ball, they must drop the ball where they were hit before returning to their "spawn point". Setup: Each team is given a "base" location consisting of 3 buckets spread out 20-40 yards apart, roughly parallel to the opposing team's buckets. (The center bucket on each side should be a bit further back than two outside buckets.) Each team is also given a designated "spawn point" which whould be 20-30 yards behind the "base" location. Finally, each team is given 8 balls of their team color (red or blue, or similarly contrasting colors) and 4 white balls (the "Powerballs"). These are placed at the team's designated "spawn point" at the start of the game. Respawn: Unlimited, 15-count at designated "spawn point". Objectives: Take your balls to your opponent's "base" and get them into one of their buckets. Any balls in a team's buckets when the time is called score points for the opposing team. The two outside buckets are worth 1 point each, the center bucket is worth 3 points. A "Powerball" in a bucket is worth double the normal points (so 2 or 6). Balls not in a bucket when time is called are worth no points. The team with the most points wins. Special Rules: A player may only carry one ball at a time, and they may only carry balls of their team's color or "Powerballs". No player may intentionally touch, pick up, block or otherwise disturb a ball of the opposing team's color at any time. When a player is hit while carrying a ball, they must drop that ball where they were shot before returning to their "spawn point". (The ball may not be dropped into a bucket after a player has been hit.) Any player may touch, pick up, carry, block, etc. a "Powerball" at any time, except that you may not attempt to strip a "Powerball" from the hands of another player. Once a ball, whether it be a normal ball or a "Powerball", has been placed in a bucket, it may not be removed by either team. Setup: Each team is given a "base" location with a "core" - a large container with a receptacle for darts/arrows/missles/nerf balls/etc to be fired into. Each team is also given a designated "spawn point" which should be 20-30 yards behind their "core". Objectives: Put as many darts/arrows/missiles/balls/etc into the opposing team's "core" as possible within the time limit. Each "hit" on the core - i.e each dart or other projectile put into the "core" - counts as 1 point. The team with the most points when time is called wins. Variants: Scoring can be adjusted by allowing larger projectiles, which are generally shorter ranged/less accurate/otherwise harder to get into the core, to be worth more points. For example - all arrows/missles/nerf balls could be worth 5 points. There could also be 1 or more "bombs" placed in the middle of the playing field. (i.e. a colored ball - a player carrying it may not shoot/melee, and must drop it immediately if hit.) The ball may not be thrown, it may only be dropped into the "core" when the carrier can touch the "core" with both hands. These bombs could be worth additional points - i.e. 5 or even 10. Teams: 1 or more "Zombies" (each armed with a single melee weapon only), everyone else is a "Human" (each armed with whatever weapons are allowed). Zombies should be designated by wearing a clearly visible loop of flagging tape around their neck/head/arm/etc. Respawn: When a "Human" is tagged out by a "Zombie", they are "Infected" and turned into a "Zombie". The new "Zombie" must go to the "Zombie Spawn" location and drop all weapons they are carrying and arm themselves with a single melee weapon instead. They must also acquire a flagging tape loop as described above. When a "Zombie" is tagged out by a "Human", they should sit/kneel down and begin a 15-count. During this time the "Zombie" may not move or attack. When the 15-count is reached, they may become active again. Objectives: The "Humans" must try to survive until time is called. The "Zombies" must try to "Infect" as many humans as possible. The only winners are the surviving "Humans" when time is called. Like I said over on the revolution, I will be there. Along with my Dad and Brother. Possibly some guests. I'm not committing to being there or not being there, given my history of trying to attend these wars something will pop up at the last minute to stop me from going. If I show up it'll be wonderful, if not no surprise. Don't worry so much about what other people will allow. Throw your own wars and kick your friends' asses until they all want one. Why do I get the feeling that the chances of you showing up are somewhat higher for having said that...? Edited by Ambience 327, 03 September 2012 - 03:45 PM. Since the attendance for this war looks to be a bit smaller than last time, I am going to try something. Darts that weigh roughly the same as a #6 slug and still maintain a felt tip will be accepted for use provided you allow me to inspect them for safety and let me test fire them on you and have you return the favor. Keep the weight in mind though - I don't want slingshot weighted darts popping up please. We will see you guys on the field tomorrow. Just an FYI - we are still a go unless there is lightning or pouring rain. Great war, in spite of the weather and the army of...shall we say..."adoring fans". I couldn't help feel bad turning all those little guys away, but they were WAY younger than I was comfortable with allowing for walk-ons, and we really weren't equipped to deal with them. Sorry about that guys - that place has NEVER been busy like that, what with the picnic and all, before. Of course, my previous wars all took place in between school years - something to keep in mind for next year. The older guys who did play with us were pretty cool though. And the rounds we got in between the rain showers and the mini-hailstorm were all quite fun. I loved carpe as always, despite having only 1 ball in my team's bucket at the end. It was great seeing all the returning faces, and meeting some new folks (like DM's sister*, Phoenix's dad & cousin, etc), and it was definitely great having Ryan, Wes and DarkMatter present, continuing the tradition of all of us rocking out at Foam in the Fort. You guys are officially disallowed from ever missing one. EVER. * P.S. - long live the Queen and victor of the melee-only "Highlander" round. Her tactic of blending into the environment in her bright pink jacket, and sneaking up to back-stab the "winner" of the round when he thought he had slain all opposition was clearly superior, and in no way instigated by the war host or anyone affiliated with the war in any manner at all. No sir. Not a bit.